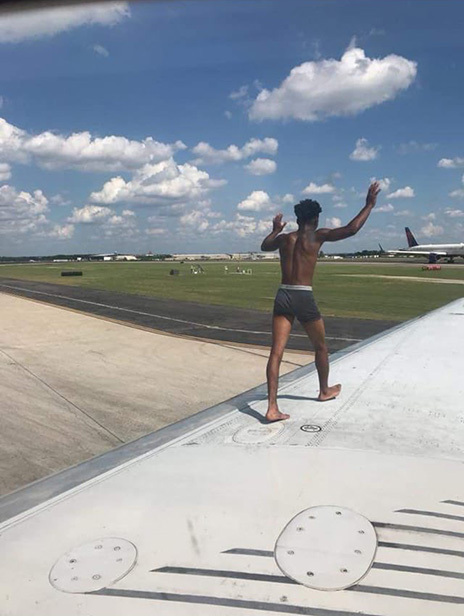 After scaling a barbed wire fence, a 19-year-old Georgia man ran across the tarmac at Atlanta’s busy airport and pulled himself up onto the wing of a Delta jet and began pounding on the aircraft’s windows as shocked passengers watched from inside. 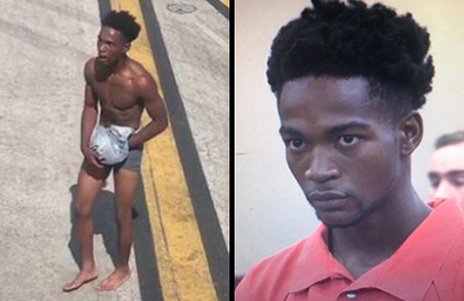 Jhyrin Jones, 19, was arrested yesterday afternoon minutes after running up to the airplane, which had just arrived from Miami. Jones, who had stripped to his underwear, gestured to passengers while ranting incoherently. 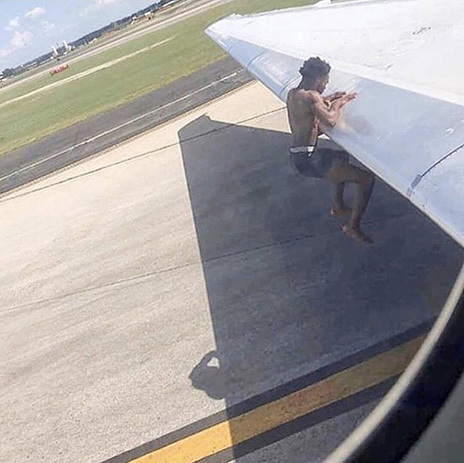 As seen above, at one point, the agitated Jones mounted one of the jet’s wings and began pacing and banging on cabin windows (as travelers photographed his bizarre antics). Jones was subsequently subdued by airport police and charged with trespassing, damage to property, and obstruction of law enforcement. He was also hit with a public indecency count for allegedly exposing himself to the plane’s stunned passengers and crew. During a court hearing this morning, a judge set Jones’s bond at $18,000. Jones is pictured below on a Hartsfield–Jackson Atlanta International Airport runway and in court today.